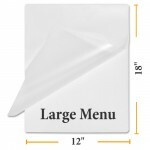 Large Menu 12x18 Size Heat Seal Lamination Pouches. Each Laminating Pouches Measures: 12" x 18", consists of two sheets of film connected on one edge and laminates 11 1/2" x 17 1/2" documents. Laminating Film Thicknesses: 3 Mil, 5 Mil, 7 Mil or 10 Mil Laminating Pouch Finishes: Clear Gloss, Matte and Sticky Back Thermal Laminating Sheets for use in any pouch laminator machine.